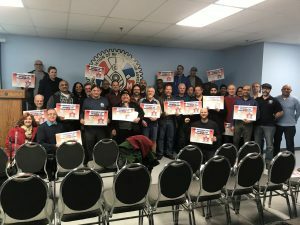 Toronto, ON – Being a Union political activist takes time, your time, time that could be spent doing other things so if you want change for the better, you’re going to have to dedicate your time. In short, if you don’t like the government you have, put your time where your mouth is and do something about it. Get involved in the political process. “IAM political action committee members know the value of member engagement,” explains Derek Ferguson, IAM Special Representative for Political Action. “The more members who are actively engaged in our workplaces – the more power we have at the bargaining table. The more members who speak up on issues that matter in our communities, the more power we have to get our governments to prioritize the needs of working people.” Often it is hard for members to grasp that there is a connection between collective bargaining and political action. There is a direct connection between negotiating a pension into your collective agreement and lobbying the government to protect that pension if the employer goes bankrupt, as an example. So to all IAM Canadian members, get familiar with the issues that will affect our working lives, and the issues that will affect our family lives. Talk to your fellow members, discuss issues with your family but take the time to do it. Check with your local lodge about its Political Action Committee and get involved. Remember if you won’t take your time to change your life, you have no right to complain! These members gave up a Saturday morning to be politically active, why can’t you?